Collector-oriented record stores may be a dying breed, but Fernando Carpenter launched one, anyway. You don't need to be a genius to realize that record stores are an endangered species. (Just Google "closed record stores" to see the viral "40 Sad Portraits of Closed Record Stores.") But while brick-and-mortars may be disappearing, fans who still desire hard copies of music haven't — they've just gone underground. There's the annual Record Store Day, of course, which brings attention to mom-and-pop stores and vinyl enthusiasts with special releases and giveaways. Locally, there are record swaps, such as the one held every other month by DJ Roger Mas in West Oakland. And then there are tiny little stores like Vamp Records. Opened two years ago, Vamp Records was conceived as an all-vinyl shop and art gallery specializing in soul music, defined by owner Fernando Carpenter as jazz, R&B, funk, and the like of the Fifties, Sixties, Seventies, and Eighties. Unless you live in the area or someone gives you directions, it's likely that you've never heard of the place. In addition to being located in the residential neighborhood of Cleveland Heights, it also has never been promoted in the traditional sense (although it now has a Facebook page). But Carpenter says customers — mostly record collectors — somehow discover him anyway. Local residents have also come by, offering him their old dusty records. Such an obscure shop is fitting for a guy who grew up liking obscure music. Growing up in the Bay Area at a time when everyone was listening to hip-hop and new wave, Carpenter was drawn to oldies — specifically, African-American music. At age thirteen, he started collecting records: 7-inches, 12-inches, 45s. He was, in a way, the real-life Seymour from the movie Ghost World. By the time he reached adulthood, he had amassed 8,000 records. He'd frequent flea markets, garage sales, thrift stores, and antique shops looking for records that no one wanted. But after he got married, they mostly just collected dust. He says his wife wouldn't let him listen to loud music. When they divorced, Carpenter realized he could finally play his records, but he didn't want to be confined to such a "hermit activity." "I needed to meet new people and be out and about, and not be secluded," he recalled. "I decided I needed to relinquish my property." Thus, Carpenter opened up his personal collection for sale. For three years, Carpenter ran an impromptu record store out of his Rockridge home. It mostly drew niche record collectors like himself. But, eventually, he outgrew the space. Then he happened to come across an empty storefront located in Cleveland Heights, near Lake Merritt. "It was very reasonable," he said. "It had the inviting storefront that I wanted. It just kind of happened." Carpenter, who works in the tech industry, which affords him the income for such endeavors, decided to expand the store's offerings beyond his own collection and make it a consignment shop. He says the concept is modeled after one of his favorite record stores, Crossroads Music, in Portland, Oregon. He got ten local collectors to get involved: Instead of organizing the records by genre, they're organized by collector. The idea, Carpenter said, was to make it "a fun way to search for records," as well as a way to expose listeners to music they may not know about otherwise. "People stay anywhere from half an hour to two hours," he said. "I like that — they're making an effort to find things." While the store was originally focused on soul, the collectors, one of whom works there, have diversified Vamp Records' offerings. Carpenter says about half of the stock is now bluegrass, classical, and international. So far he's had one art show and eight performances (invite-only, since he doesn't have a cabaret permit) featuring a variety of music. Because the building cuts into a steep hillside, part of the back room is actually underground, which makes it incredibly soundproof. But Carpenter insists he has no pretensions about becoming a live music venue. 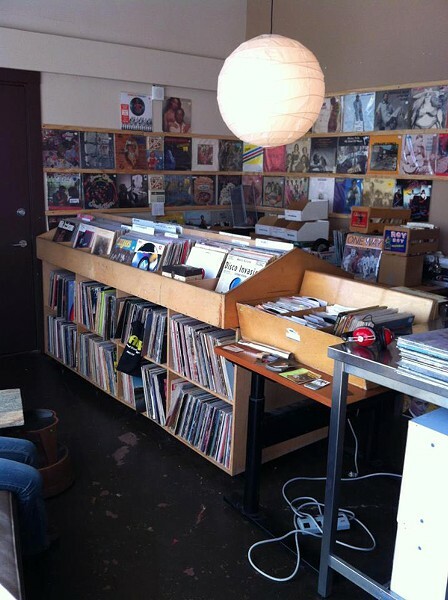 At base, Vamp Records is a place to enjoy records — out in the open. "Record shops now are becoming a boutique, antique thing. You can't touch it," he lamented. "We're not like that."